Namkeen Gosht (salted meat) belongs to KPK and Peshawri Namkeen Gosht is famous due to its unique taste. The interesting thing is, it gets the ultimate delicious taste with a few ingredients. 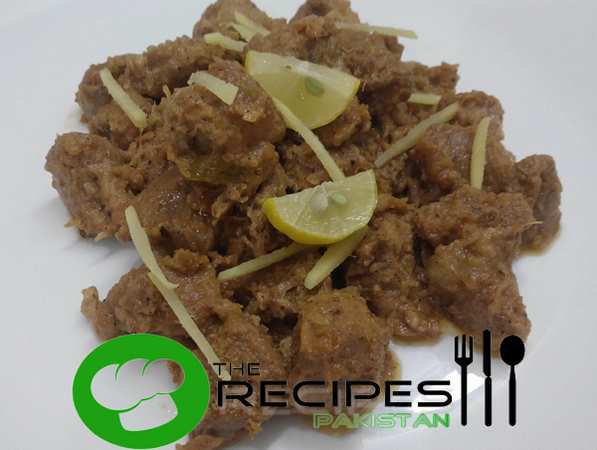 I read many and tried some of namkeen gosht recipes, but the following recipe I liked the most in taste. I got the method from Dawn while browsing on google. The original recipe is just mentioned about use of meat and typically this is made with beef. In Pakistani Recipes this is a scrumptious meal idea in lunch and dinner. Heat oil in heavy-lidded wok. Fry green chilies and ginger for a minute, adding meat, salt, tomato and black pepper, stir on high heat for a few minutes until the heat causes the meat to release its juice. Seal pot with lid and simmer on low to medium heat for a few minutes, turning the heat to low and cooking until meat is tender and falling off the bone. The meat juices gradually steam and evaporate, sealing in the juices, and slow cooking to perfection. Avoid adding water if possible, but if need arises, add a little to complete the cooking process. Serve with naan, lemon wedges and sliced onions.